I don’t like the idea that I have to memorize an entire deck of cards in order to win a game. If I wanted to brush up on my card-counting skills, I’d go to Vegas and play BlackJack or Poker for a few days. I truly don’t mind occasionally being surprised at the cards that appear. A card Event should equate to an “opportunity” presenting itself. What can be developed from the opportunity is what separates the great players from the dabblers. So I’m pleased that Labyrinth is not just a card-counting exercise. Having said that, I must now backpedal a bit and admit that there are several cards that every Labyrinth player MUST be aware of. The purpose of this article is to point out some of the key cards that can either make or ruin your day, depending on which end of the Event you find yourself. Awareness of these cards, and what they can do, will improve your game. They find themselves with more cards than the US player, allowing them to play one or more unanswered Operations or Events. US Prestige is reduced, since this adversely affects the US ability to wage “War of Ideas” operations. US Posture is opposite that of the rest of the world, which also adversely affects “War of Ideas”. An opportunity to place Cells in the United States arises, possibly leading to a WMD event and an automatic victory for the Jihadist Player. With this list in mind, I present the “Big Four” Event cards for the Jihadist Player. 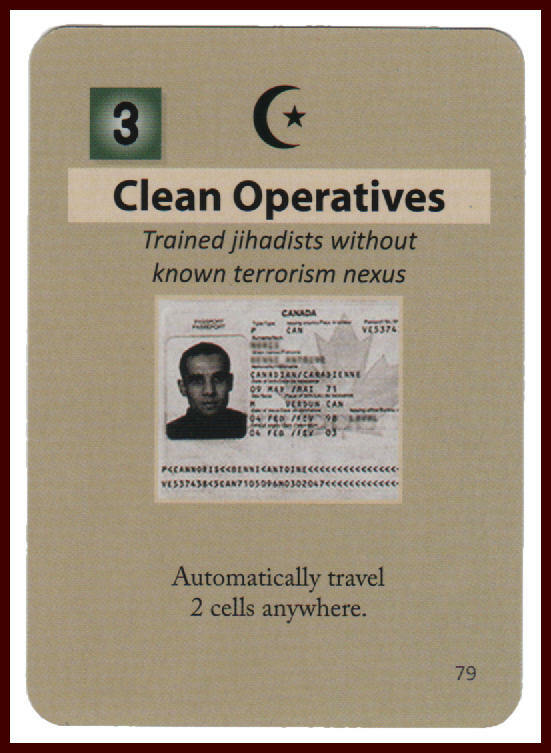 Clean Operatives: “Automatically travel 2 cells anywhere.”This card can be used to place 2 Cells within the United States automatically, something that could normally take several attempts (and many wasted cards) using conventional Travel or Recruit operations. And it gets worse for the US Player. 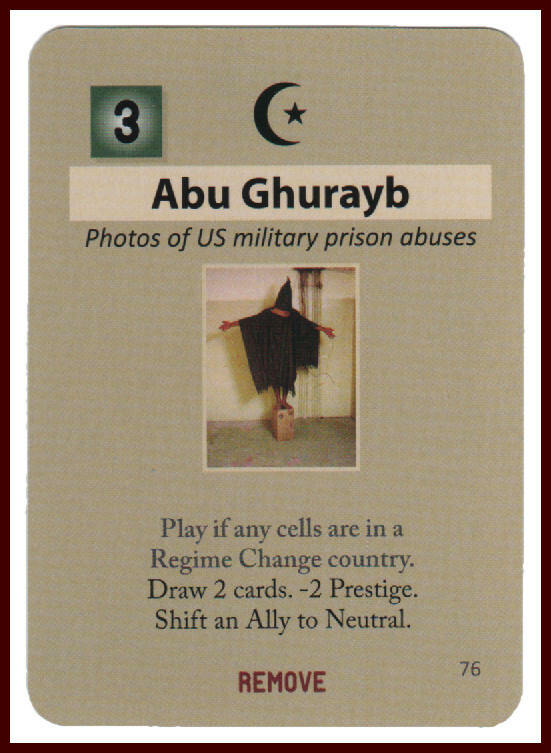 If this card is played as the first card of the Jihadist turn and he just happens to be holding WMD Plot chits, the second card play can be used to place the WMD plots in the US… or to place non-WMD Plots (that the US Player will have to assume are WMD Plots). Since an un-blocked WMD Plot executing in the United States causes an immediate victory for the Jihadist Player, I foresee the US Player expending two 3-Ops cards to block those Plots, and then an additional two cards for Disrupt Operations to eliminate those 2 Cells. So, there is the possibility that 4 US cards, two of which must be 3-Ops cards, will be spent to counter the effects of two cards played by the Jihadist, only one of which must be 3-Ops. This is the type of “force-multiplier” card that can win the game for the Jihadist player in short order. Abu Ghurayb: “Play if any cells are in a Regime Change country. Draw 2 cards. -2 Prestige. Shift an Ally to Neutral.”This is one of the cards that I like to call “Trifecta” cards. It causes three bad things to happen to the US Player, two of which are on the “maximum advantage” list I mentioned earlier. The ability to shift a US Ally country to Neutral limits US ability to deploy troops there, and prohibits the country from attempting “Disrupt” operations on its own (i.e. without the presence of US Troops). 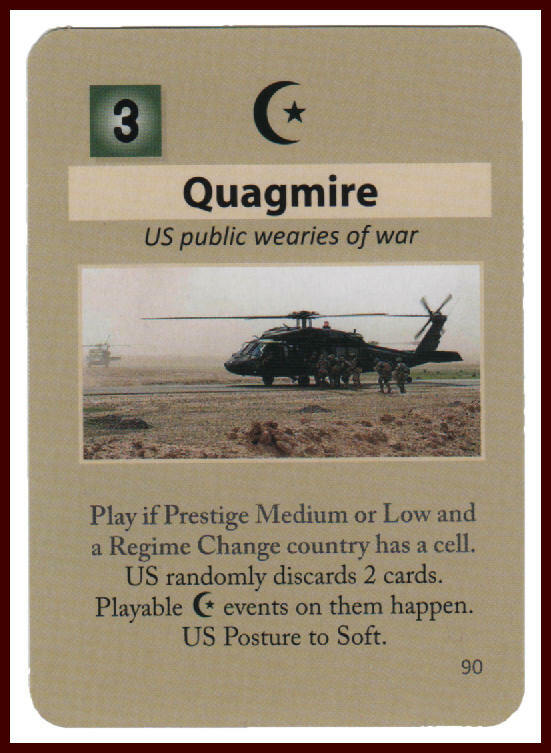 Quagmire: “Play if Prestige Medium or Low and a Regime Change country has a cell. US randomly discards 2 cards. Playable Jihadist events on them happen. US Posture to Soft.”Another “Trifecta” card. It’s bad enough that the US Player has to lose two cards, thus causing a deficit for the turn. But, to rub salt in the wound, any Jihadist events on those cards will execute as well. The shift of US Posture to “Soft” can also be devastating, depending on the World’s Posture at that moment (it could actually work out well for the US under certain circumstances). One thing is for certain; the US is not allowed to perform Regime Change operations when at “Soft” Posture, thus limiting his options. 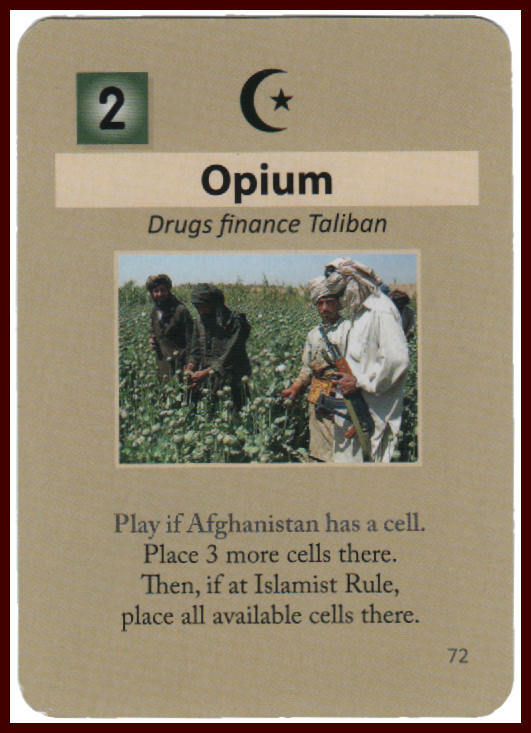 Opium: “If Afghanistan contains a Cell, place 3 more Cells there. Then, if at Islamist Rule, place all available Cells there.”Wow. So, if the US has decided to play it safe and has not opted for Regime Change in Afghanistan (thus leaving it at Islamist Rule), every remaining Cell on the Funding Track can be placed in Afghanistan! Suppose this card is played early in the game? You could end up with a situation where all 15 Cells are in Afghanistan! Imagine the US Player trying to keep control as Cells go scattering every which way around the map. Not good for the US. This card is an exception to the “maximum advantage” list, above, but… wow (again), it’s such a powerful event, I had to include it on the list. I believe that the cards favor the Jihadist Player. Their events, in general, inflict a lot more pain on the US than vice-versa. I suppose this makes sense since the US military is designed to disrupt ordered societies, and is therefore less effective on enemies that draw sustenance from chaos. The rules compensate the US for this in some ways, such as their ability to perform most operations such as Disrupt, Alert, Deploy, Regime Change, and Reassessment without having to roll dice (War of Ideas being a notable exception). So, for the US player, the most beneficial events will be those that assist in the execution of successful War of Ideas operations (i.e. those that raise US Prestige, or allow the US to select Postures), and those that prevent a sudden-death loss due to a WMD Plot in the United States. Another requirement for inclusion on the US “Big Three” list is that the card must not be dependent on any other card, nor may it be blocked by any other card. The “Big Three” Event list for the US Player is presented below. NEST: “WMD plots in the US are always face up.”To put this event in perspective, imagine your national Intelligence agency having that type of certainty in the real world? That’s why I included this card at the top of the list. Safer Now: “Play if no Islamist Rule and no Good countries have cells or plots. Roll US Posture. +3 Prestige. 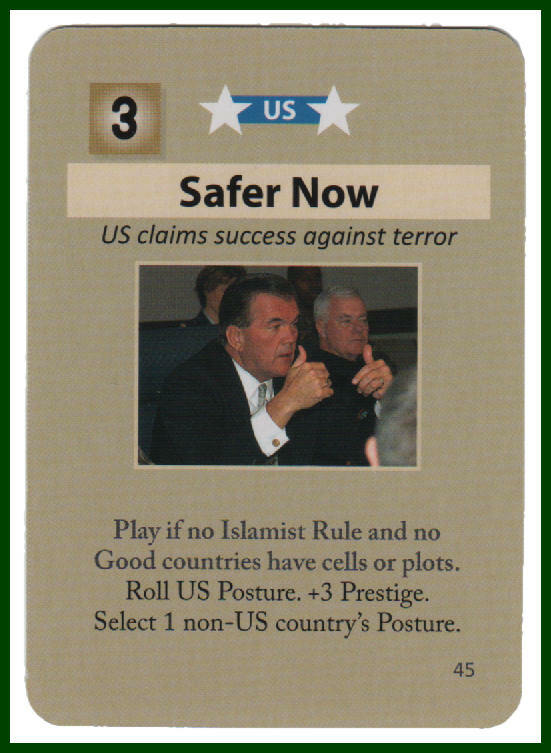 Select 1 non-US country’s Posture.”If the US Player can demonstrate proficiency in safeguarding the nations of the Free World (represented in the game by creating an environment in which there are no Islamist Rule countires and no “Good” countries with Cells or Plots), this card is the reward. It’s one of the precious Pretige-increasing cards (+3) with the additional kicker of allowing the US to select the Posture of one other country. This Posture change could shift the “US GWOT Relations” table back to an advantageous state for the US Player. As always, the directive for the US to “Roll US Posture” is not necessarily a good thing. There’s a 50/50 probability of rolling to match the current US Posture. It could go either way, and the US Player may or may not benefit from the result. But the silver lining is the fact that the US gets to roll its Posture first, before deciding on the Posture change in the other country (card instructions are always implemented in the order listed). This may help the US Player mitigate any negative effects of an undesirable US Posture change. CTR: “(Cooperative Threat Reduction) Play if US Soft. Place CTR in Russia and, if Ally or Neutral, Central Asia. It blocks Loose Nuke, HEU, and Kazakh Strain.”Once again, it’s about protecting the homeland from a WMD attack. This card should be played the instant it appears in the US Player’s hand (if his Posture is currently Soft). 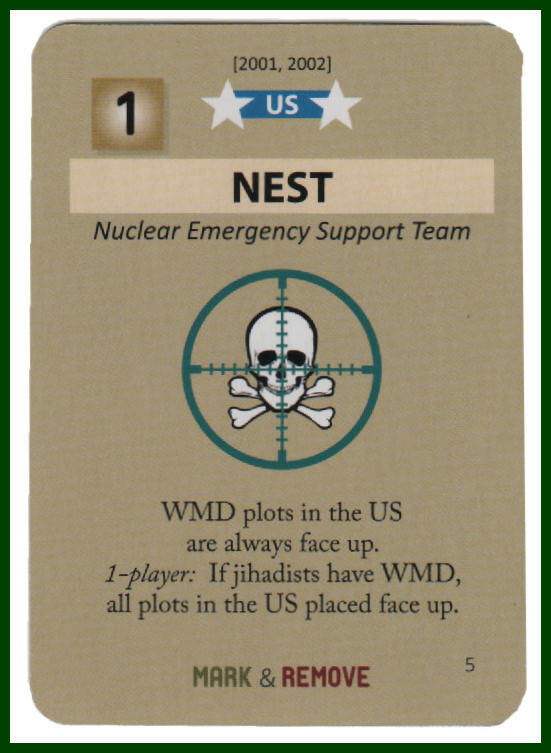 The three cards mentioned, Loose Nuke, HEU, and Kazakh Strain are all cards that allow the Jihadist player to place one WMD Plot marker in his available Plots pool. This card represents an extraordinary cooperation between the US and Russia on non-proliferation. There is also the “FSB” US affiliated card which forces the Jihadist player to discard the Loose Nuke, HEU or Kazakh Strain cards if any of them are present in his hand. 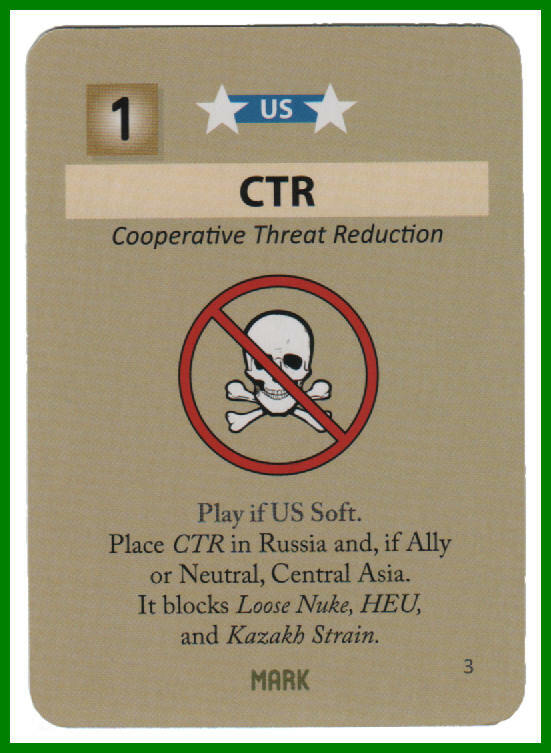 The problem with this card is that the US Player would have to have some reasonable belief that the Jihadist Player was holding one or more of these cards otherwise it’s wasted effort. For example, prior play of the US affiliated “Intel Community” card would allow the US to inspect the Jihadist hand, thus confirming the presence (or absence) of those cards. All things considered, it’s best to play the CTR card to prevent the Jihadist from ever having hope of playing those events. There are many good event cards that are not affiliated with either side, and can be used for the advantage of either player, but there is only one that is a true “game-changer”. Oil Price Spike: “Select, reveal, and draw a card other than Oil Price Spike from the discard pile or a box. 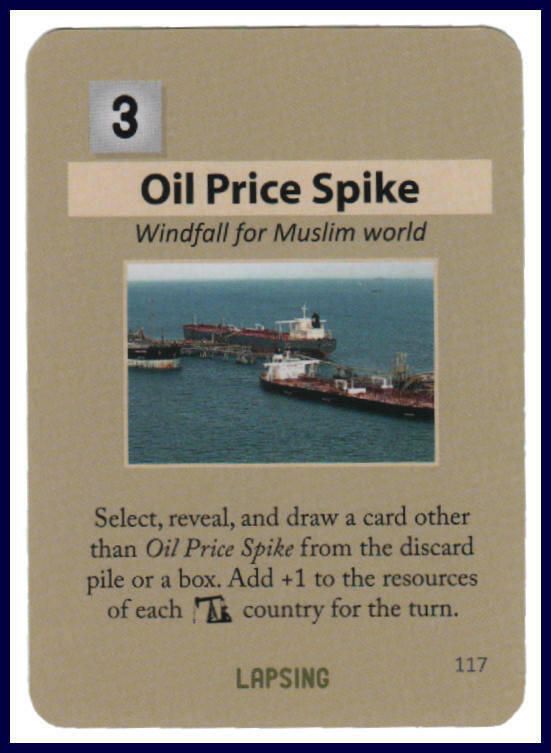 Add +1 to the resources of each Oil Exporting country for the turn.”The “Oil Price Spike” card can be played by either player. Not only does it allow for the resurrection of a previously used card (most likely one of the “Big Four” or “Big Three” mentioned earlier), but also enhances the Resource points for every Oil Exporting country on the map. A significant number of the games that I’ve played have been won as a direct result of playing the “Oil Price Spike” card. Both players have a victory condition that requires them to control X number of Resource points (by “control” here I mean Good Governance for the US Player, Islamist Rule for the Jihadist Player). Play of the “Oil Price Spike” card instantly inflates the number of Resources controlled by both players, and can push either of them (or both of them!) across the finish line to victory. Here are some (possibly) useful Labyrinth card statistics that I felt compelled to compile. So we can see that while the Jihadists only have one more affiliated card than the US, they do have a 7% edge in total Operation Point value due to the considerable advantage in 3-Ops cards. “Roll Prestige” Cards 5 66.6% to 88.3% chance of a Prestige decrease (-) of between -1 and -6 points! This assumes a best case/worst case scenario. In other words if the card holds the possibility of increasing Prestige by +1 or +3, I assumed the best case of a +3 increase. Similarly the decreases assumed the worst case, i.e. the largest negative. Any card that could either increase or decrease Prestige was counted in both totals accordingly. Again, we see a bias toward Prestige decreases in the average decrease of the +/- cards. However, the biggest skew against the US Player is to be found in the cards that direct you to “Roll US Prestige”. There is a 66.6% chance that Prestige will be lowered by at least -1 and as much as -6. To make matters worse, if the US currently is suffering a GWOT Relations penalty, the Prestige die roll is modified by -1 which then makes it 83.3% certain that US Prestige will decrease! Maintaining Prestige is a constant struggle for the US Player. Note: There is a “Prestige Change Summary” that, for some reason, was placed on the next to last page (23) of the Playbook, rather than the Rule Book. This summary chart lists all the ways that Prestige can be increased or decreased, and should be referred to often by both players to insure that opportunites to shift Prestige (in either direction) are not being overlooked. Funding Decrease (-) 24 Mostly small changes (-1, -2), but includes one card that sets Funding all the way back to 1. Funding Increase (+) 4 Includes two cards that increase Funding to the maximum (9). There are so many interesting and effective Event cards in this game that it is really difficult to narrow a list down to just a handful and label them the “most important”. But I believe the cards shown above form a decent list of Events that all new (and not so new) Labyrinth war game players must be aware of.